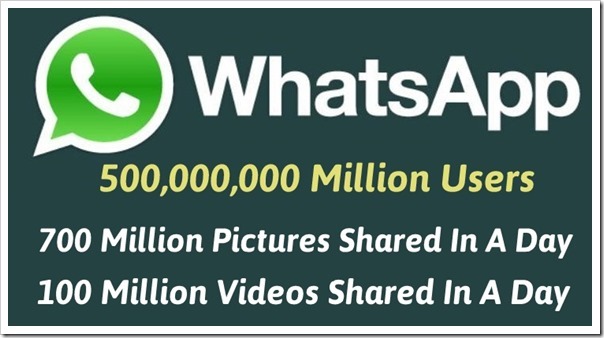 WhatsApp Userbase Explodes To 500M, Adding 25M Monthly! When Mark Zuckerberg bought WhatsApp for whooping $19 billion in the month of February, he was pretty clear about his goal: A billion WhatsApp users. And it seems he is right on the way to achieve that. In a recent blog post by WhatsApp, it has been revealed that they have crossed 500 million threshold as of now, with a scintillating pace of 25 million new users every month! These 500 million registered users are collectively sharing 700 million pictures and 100 million videos every day. Earlier, we had shared that WhatsApp is managing a record 64 billion messages a day. As per the official blog, WhatsApp’s growth is on steroids, especially in countries like India, Brazil, Mexico and Russia. Officially, out of 500 million, 48 million users are based in India while Brazil accounts for 45 million users. He further said that Android and Smartphones are the biggest triggering factor for this astounding growth story. As per the statistics, people who have never used internet or computer but have a smartphone are the ones who are most actively signing up with WhatsApp and making it really huge. And the most interesting part is that, WhatsApp has not yet integrated with Facebook yet, a process which is still underway. Facebook itself has billion+ users, and the technology enthusiasts are simply trembling at the scenario when both of these platforms officially merge; thereby creating world’s strongest platform ever witnessed. But the best part is that WhatsApp is not yet considering monetizing as their primary goal. They are aware that user-experience is the most important thing as of now. Micromax Handsets Now “Made In India”; Manufacturing Starts In Uttarkhand!